Our Outreach Ministry encompasses several activities. Two of the ministries take us out into the world to do God’s work with our hands. These ministries include our Stand Down Clothing Tent Ministry and our San Diego-Tijuana Mission Outreach. All are invited to help with these ministries; no church membership is required. Stand Down, run by Veterans Village of San Diego, is offered one weekend a year usually in July. It is held at San Diego High School and is a time for homeless veterans to get clean clothes, a place to shower, a safe place to sleep, nutritious food, doctor’s care, legal and financial assistance, and a chance to get off of the streets all together. Ascension’s mission helps organize the clothing tent before the event begins. Between 800-900 veterans benefit from this relief every year. ​The San Diego-Tijuana Mission Outreach is a chance to really get our hands dirty. 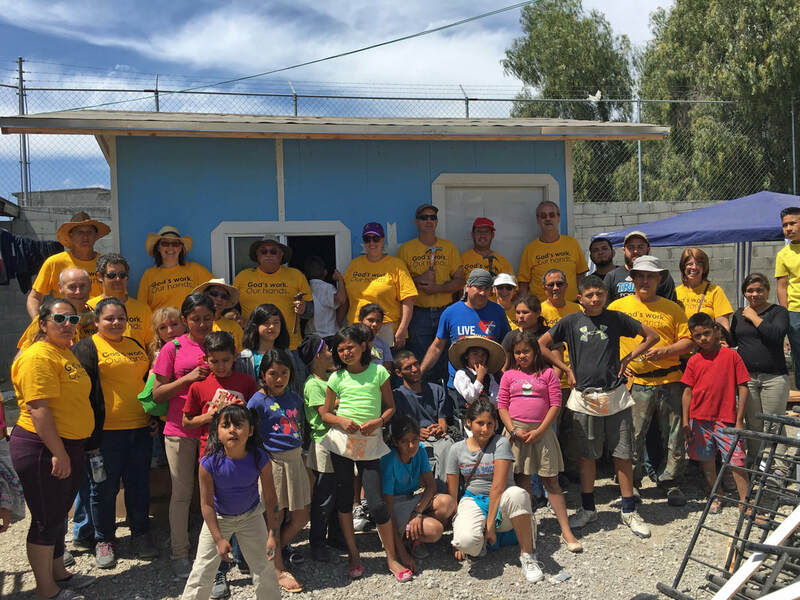 We spend one Saturday in the fall building a house in Tijuana for a family in need. It is a 12X12 house with one window and door, but it becomes a home for a family in one day. We have changed many lives with this mission! Two community dinners. One is held in early December, and the other is scheduled subsequent to the Easter Holiday. All in the community are invited at no cost to the participants. Our Annual Craft Fair is usually held in November. Artisans from the community are invited to sell their crafts and wares. This is a huge event and perfectly timed for pre-Christmas shopping! Ascension sponsors various community food distribution programs. All members of the community in need of food are invited to participate. A community food distribution held on the first Friday of the month. A food pantry available during Church office hours. An outdoor community food pantry located on 51st Street. This food pantry is available 24/7. The community partners in stocking this food pantry. Stay tuned, as we are always open to new mission and outreach opportunities.